The final part of the project which has been funded with a bursary from a-n The Artists Information Company involved using the knowledge and techniques learnt at Hot Bed Press to create my own ceramic screen prints. I wanted to make my own screens using the facilities available at HBP and then print my own ceramic inks onto paper. The paper in turn could then be used to transfer the prints onto three dimensional surfaces. I started off by modifying one of my designs on a computer to create 2 different scales, then printing them off onto A4 paper. These were then photocopied at high density to create the negatives for burning the screen. I managed the whole process almost on my own but needed technical help at certain points due to my inexperience. The finished screen turned out fairly well except for the fact that the negative image wasn't quite dark enough which made the image in the screen slightly hazy. The hazy image could possibly affect the printing later on - I had similar problems on the 'Sreen Printed Poster' course with Nick Rhodes. After discussing the problem with a fellow artist at HBP he told me that I could in fact use the original prints from my inkjet printer as negatives as long as the ink didn't run when it was oiled - this would negate the photocopying process and I could also make sure the images were dark enough and not have to rely on the repographics. I have decided I will be doing some experiments with my own printer at some point to see how dark I can get the images and whether the ink would run if it was oiled. Back at my workshop, I set up a very simple jig to hold the newly burned screen so that I could print with my own home-made ceramic inks. These inks are made using a fine clay slip mixed with an acrylic print medium. Knowing from previous crude experiments that the ceramic slip ink needed to be thick, I built up 8 print layers on each sheet of newsprint. Each sheet needed to dry before moving onto the the next process. The next stage was to cut out areas from the dry newsprint which I could apply to the various ceramic forms I had made earlier. These clay forms hadn't been allowed to dry out completely as I needed brush a base layer of white slip onto them first. The white slip was allowed to dry a little so that it was still a bit tacky to the touch. The cut-out pieces of newsprint were soaked in water and then applied onto the white slip. The idea is that the darker screen printed designs transfer from the paper to the pot and then the paper can be peeled off as soon as it begins to dry. Getting the consistency and timing right proved to be quite tricky but after a while I got to know exactly when the paper was ready to be peeled off (this was helped by using a heat gun to dry it out quicker). I found a lot of the prints didn't completely transfer from the newsprint, which broke up the design and gave it a slightly weathered look. Once the forms have dried out they will be bisque fired so that they will survive the trip down to Wales for the glaze firing. 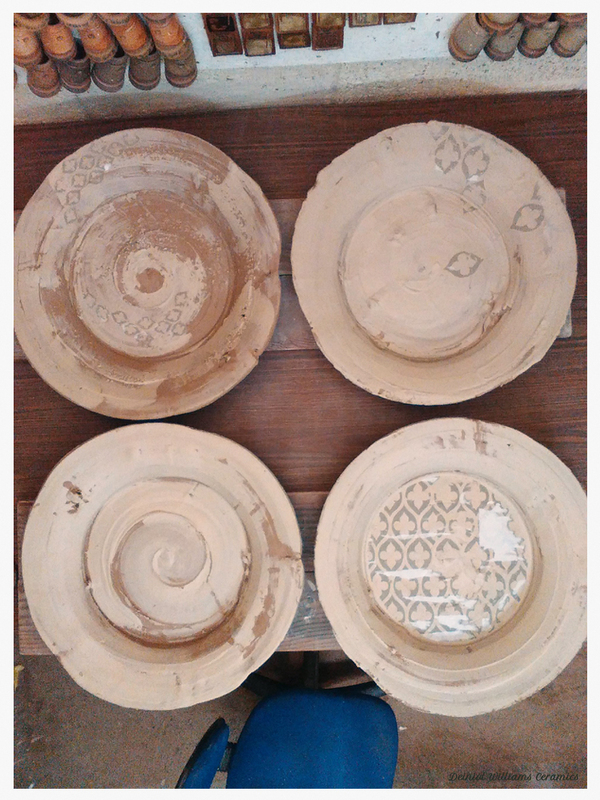 The glaze firing will be done in a wood-firing kiln which will take over 24 hours to fire. 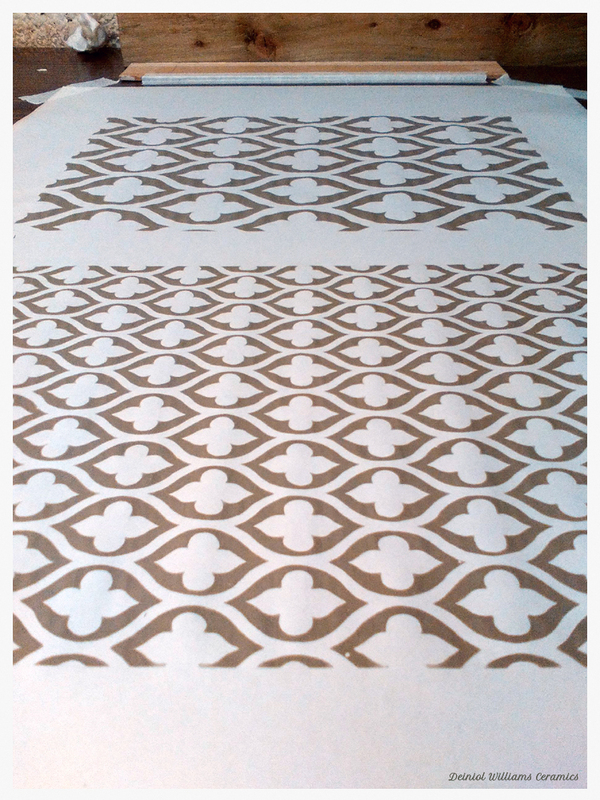 This will be the final stage for the experimental screen printed ceramic slip transfers.